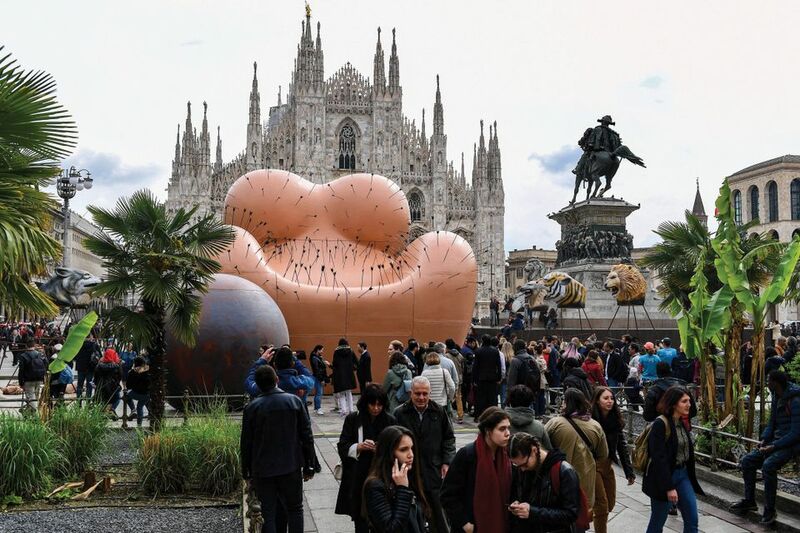 A monumental outdoor sculpture created by Gaetano Pesce as a critique of the patriarchy has sparked outrage among Italian feminists, who say it in fact perpetuates violence against women. Made for Milan Design Week, the eight-metre-high installation Maestà Sofferente (Suffering Majesty) resembles a woman’s torso covered in arrows, chained to a ball and under attack from wild animals. It was unveiled in Milan’s Piazza del Duomo on Sunday 7 April to celebrate the 50th anniversary of Pesce’s Up armchair, which the Italian designer has said he conceived in 1969 as an “image of a prisoner”, embodying women’s suffering “because of the prejudice of men”. On Monday, the self-styled “artivist” Cristina Donati Meyer added her own intervention to Pesce’s woman-armchair, throwing red varnish on the seat as “a kind of menstruation to bring back to reality the artist who imagines a woman only as a piece of furniture”, according to her Facebook account. Cristina Tajani, Milan’s assessor for fashion and design who invited Pesce to participate in the city-wide Fuorisalone programme alongside the Salone del Mobile furniture fair (until 14 April), welcomes the debate. “It is positive that women are speaking out on the representation of their own bodies,” she writes on Tumblr. “The creative space of Design Week is, and must be, a space for discussion on the meaning of a work of art, not only an aperitivo party.” The work is expected to remain on view in Piazza del Duomo until 14 April.